Part 1 The Rhetoric: An urgent context for twenty-first century librarianship; Human rights, contestations and moral responsibilities of library and information workers. Part 2 The Reality: Practical strategies for social action; Prevalent manifestations of social action applied to library and information work; Specific forms of social action used in library and information work for social change. 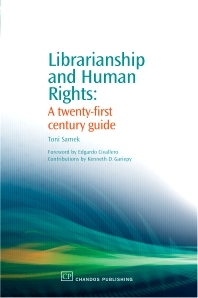 In this book, the reader will encounter a myriad of urgent library and information voices reflecting contemporary local, national, and transnational calls to action on conflicts generated by failures to acknowledge human rights, by struggles for recognition and representation, by social exclusion, and the library institution’s role therein. These voices infuse library and information work worldwide into social movements and the global discourse of human rights, they depict library and information workers as political actors, they offer some new possibilities for strategies of resistance, and they challenge networks of control. This book’s approach to library and information work is grounded in practical, critical, and emancipatory terms; social action is a central pattern. This book is conceived as a direct challenge to the notion of library neutrality, especially in the present context of war, revolution, and social change. This book, for example, locates library and information workers as participants and interventionists in social conflicts. The strategies for social action worldwide documented in this book were selected because of their connection to elements of the Universal Declaration of Human Rights (1948) that relate particularly to core library values, information ethics, and global information justice. Dr Toni Samek is Associate Professor at the School of Library and Information Studies, University of Alberta (Edmonton, Alberta, Canada). Toni chairs the Canadian Library Association's Advisory Committee on Intellectual Freedom and is an Advisory Board member of the international group Information for Social Change. Toni’s teaching, research, and service interests include critical librarianship, intercultural information ethics, global information justice, human rights, intellectual freedom, and academic freedom.